Question: I’m looking for some large indoor house plants, but do not want a houseplant like a Ficus tree. 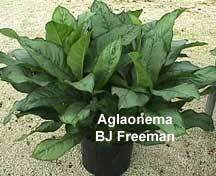 Answer: Aglaonema BJ Freeman is somewhat of an “old-timer” in the world of large indoor house plants and floor plants – this Aglaonema has proven to be an outstanding performer indoors. Make sure to give BJ Freeman plenty of space; they can get very large, tall and wide. If you’re having trouble finding it at your local nursery or garden center look for 2 “other” Ag varieties sold as “celia” or “Gabrielle” – they’re other trade names for the same plant. You should be able to have the nursery place an order for B.J. Freeman if you can’t find it. Although you can find BJ Freeman grown in 8-inch pots, it really looks best sitting on the floor as a stand alone specimen in 10 or 14-inch pot where it can reach a width of 36 inches and heights up to 48 inches or more. Generally I’d recommend you use this Dieffenbachia plant looking Aglaonema as a stand-alone specimen. The leaves can grown large and have almost a gray-green look to them. The leaves however can be damaged very easily and for best growth the plant requires good light. This excellent indoor houseplant can get large and rather tall so you may need to regularly remove the tips to stimulate new growth lower down the stem. It may sound as if BJ Freeman isn’t the best Aglaonema to use as a houseplant…but under good lighting and protected from traffic that can damage the leaves – it’s a real winner.